You’ve taken the first day of school pictures, posted them on Facebook, and sent the kids back to school, backpacks and all. YAY! Some of you are rushing off to work yourselves. Then there are others, like me, who are working from home. We all have our own sets of challenges. Personally, I struggle with the early morning wake-up call. When I #dragmybuttouttabed at 5:00 a.m., I’m not quite ready to tackle any goals. I put on my parent hat and slurp my cup of coffee while barking out reminders to my three drowsy children. After delivering them to three different schools, it takes every part of my being to resist the urge to go back to sleep. Enter the schedule. I know, I know…a schedule alone could send you back to your dreamy soft pillow. We’re taking baby steps here people. It all starts with knowing what you need and want to do, so we might as well go through some scheduling motions. Setting office hours will establish the boundaries needed to make life a little less hairy. But, when you are “open for business”, you’ve got to get down to it. If you call in sick to your writing job every day, your dreams may be a bit disappointed in you. Trust me, I get it. My “summer hours” were a little inconsistent. But we are talking about “Back to School, Back to Work” here, so let’s give it our best shot. Even though I work from home, my true office hours are generally 8 a.m.-12 p.m. and 1-3 p.m. I must confess that I am a work-a-holic, and I squeeze writing in to nooks and crannies, even when it’s not time. So, if my kids are eating breakfast before school and I have 30 minutes to work on my goals, I go for it. If I achieve my goals early, I get some time off. I kind of have that worker ant thing going on. Work first, then play. Before I load up my schedule each night, I’ve already had a chance to reflect on my whole month. Deadlines for submissions, contests, blog posts, agent/publisher research, and personal writing/reading goals are all floating through my mind. I plug deadlines into my phone and then set goals. Each night before bed, I reflect on what I’d like to accomplish the next day and set reminders for myself, purposely over planning. While nobody likes to be nagged, it kind of takes the edge off to have your phone doing the dirty job. Choose a notification tone that gets your attention and doesn’t drive you nuts. Adjust your settings so that reminders are not only audible, but sent to your email, as well. Why not reward yourself every step of the way? For me, as soon as I achieve a goal, I edit my reminder to include an emojicon, indicating that I did, in fact, do something for my writing. It’s pretty awesome to have that visual pat on the back. If I achieve all the necessities, I reward myself further. Read a book, watch TV, have some frozen yogurt…choose whatever your little heart desires. If you have extra goals left over, you can reschedule them for the next day. With just a little planning, you can make your writing time worth the while, and feel great about what you’ve accomplished. Leave me a comment to let me know what you think of your emojicon accomplishments! Great post, Carrie. I was doing very well making a to-do list each night on Evernote (it has a cool check-box feature) — and then it slipped off my radar somehow. I will go back to it tonight. Thank you! I like the idea of the emojicon “stickers” — I’ll have to see if Evernote has anything like that. If not, clicking on the check-boxes and having a check mark magically appear will do! Yay! Sounds like another great system, Beth! Glad to nudge, Deb! Let me know how it goes! Great ideas for self-employed artists (especially those of us with young kids)! Thank you so much! Here’s to hoping it helps lots of artists recognize their own accomplishments! I have started putting my goals in my phone too. I use color codes though. Haven’t thought about using emojotions. I remember being in school & getting smiley stickers. Thanks for guesting with us, Carrie! I also admire your organization. My phone calendar is synced with my work calendar, so I don’t load it up with much personal stuff, but I can try using my reminders list to do something similar. No emojicons there, but I do have different colors I can use. I’ll give it a try. I’m so impressed with your writing/organization schedule. 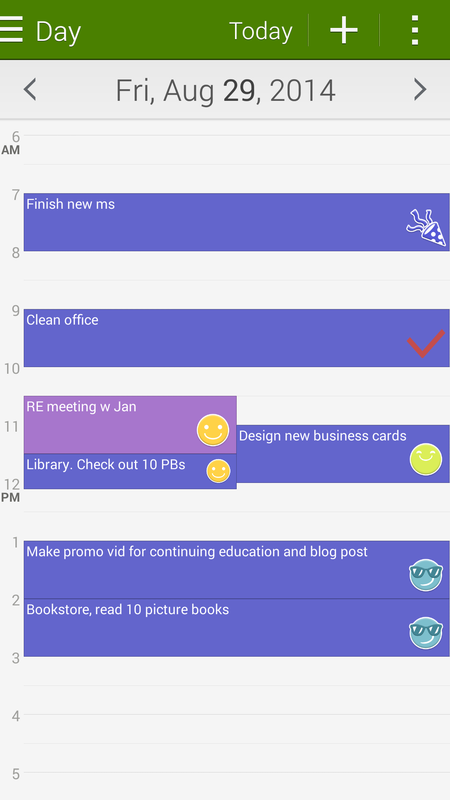 I love the idea of having your phone remind you of writing goals and objectives….I just add everything to my list of reminders and look at it periodically throughout the day. Now, to find time to schedule writing time! lol. Thanks, Kirsti! Try rewarding yourself with an emojicon or two and let me know if you feel an extra boost of accomplishment.